In a classical nova, a white dwarf siphons material off a companion star, building up a layer on its surface until the temperature and pressure are so high (a process which can take tens of thousands of years) that its hydrogen begins to undergo nuclear fusion, triggering a runaway reaction that detonates the accumulated gas. The bright outburst, which releases up to 100,000 times the annual energy output of our Sun, can blaze for months. All the while, the white dwarf remains intact, with the potential of going nova again. It’s a relatively straightforward picture — as far as complex astrophysics goes. But new observations with NASA’s Fermi Gamma-ray Space Telescope unexpectedly show that three classical novae — V959 Monocerotis 2012, V1324 Scorpii 2012, and V339 Delphini 2013 — and one rare nova, also produce gamma rays, the most energetic form of light. “There’s a saying that one is a fluke, two is a coincidence, and three is a class, and we’re now at four novae and counting with Fermi,” said lead author Teddy Cheung from the Naval Research Laboratory in a press release. The first nova detected in gamma rays was V407 Cygni — a rare star system in which a white dwarf interacts with a red giant — in March 2010. One explanation for the gamma-ray emission is that the blast from the nova hits the hefty wind from the red giant, creating a shock wave that accelerates any charged particles to near the speed of light. These rapid particles, in turn, produce gamma rays. But the gamma-ray peak follows the optical peak by a couple of days. This likely happens because the material the white dwarf ejects initially blocks the high-energy photons from escaping. So the gamma rays cannot escape until the material expands and thins. But the later three novae are from systems that don’t have red giants and therefore their winds. There’s nothing for the blast wave to crash into. In a more typical system it’s likely that the blast creates multiple shock waves that expand into space at slightly different speeds. Faster shocks could blast into slower ones, creating the interaction necessary to produce gamma rays. Although, the team remains unsure if this is the case. 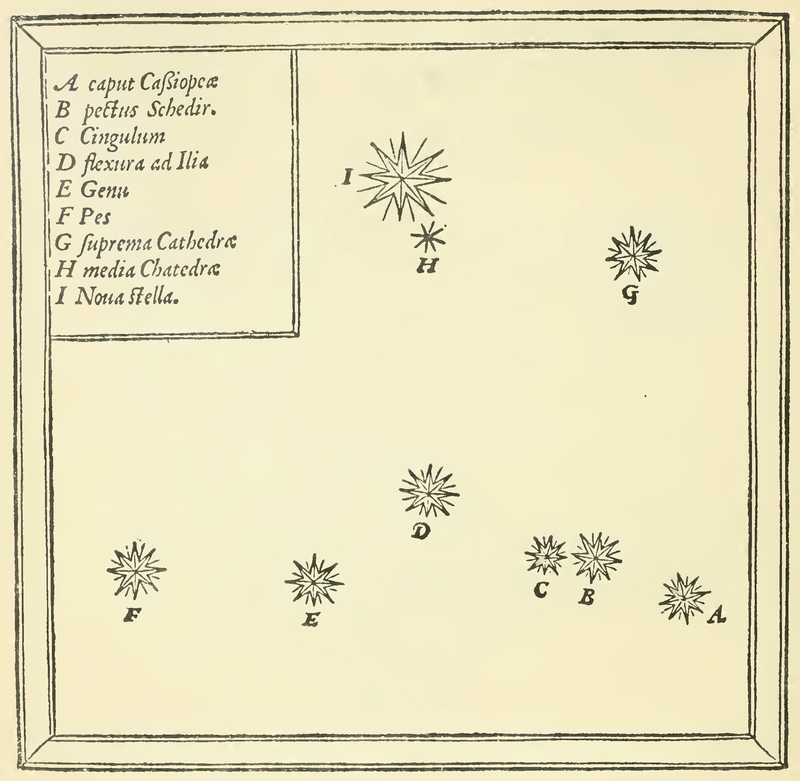 Astronomers estimate that between 20 and 50 novae occur each year in the Milky Way galaxy. Most go undetected, their visible light obscured by intervening dust, and their gamma rays dimmed by distance. Hopefully, future observations of nearby novae will shed light on the mysterious process producing gamma rays. The results will appear in Science on August 1. Imagine that you’re innocently running your computer in pursuit of helping data crunch a huge science project. Then, out of the thousands of machines running the project, yours happens to stumble across a discovery. That’s what happened to several volunteers with [email protected], which seeks pulsars in data from the Fermi Gamma-Ray Space Telescope, among other projects. “At first I was a bit dumbfounded and thought someone was playing a hoax on me. But after I did some research,” everything checked out. That someone as insignificant as myself could make a difference was amazing,” stated Kentucky resident Thomas M. Jackson, who contributed to the project. Pulsars, a type of neutron star, are the leftovers of stars that exploded as supernovae. They rotate rapidly, with such precision in their rotation periods that they have sometimes been likened to celestial clocks. Although the discovery is exciting to the eight volunteers because they are the first to find these gamma-ray pulsars as part of a volunteer computing project, the pulsars also have some interesting scientific features. Two of the pulsars also “hiccup” or exhibit a pulsar glitch, when the rotation sped up and then fell back to the usual rotation period a few weeks later. Astronomers are still learning more about these glitches, but they do know that most of them happen in young pulsars. All four pulsars are likely between 30,000 and 60,000 years old. [email protected] is run jointly by the Center for Gravitation and Cosmology at the University of Wisconsin–Milwaukee and the Albert Einstein Institute in Hannover, Germany. It is funded by the National Science Foundation and the Max Planck Society. As for the volunteers, their names were mentioned in the scientific literature and they also received certificates of discovery for their work. As a space telescope scientist or satellite operator, the last thing you want to hear is that your expensive and possibly one-of-a kind — maybe irreplaceable — spacecraft is in danger of colliding with a piece of space junk. On March 29, 2012, scientists from the Fermi Gamma-ray Space Telescope were notified that their spacecraft was at risk from a collision. And the object heading towards the Fermi spacecraft at a relative speed of 44,000 km/h (27,000 mph) wasn’t just a fleck of paint or tiny bolt. Fermi was facing a possible direct hit by a 1,400 kg (3,100-pound) defunct Russian spy satellite dating back to the Cold War, named Cosmos 1805. If the two satellites met in orbit, the collision would release as much energy as two and a half tons of high explosives, destroying both spacecraft and creating more pieces of space junk in the process. But this story has a happy ending, with the Fermi telescope still operating and continuing its mission to map the highest-energy light in the universe, all thanks to a little orbital traffic control. You can watch the video here for the complete story, or read more at the Fermi website about how the Fermi Space Telescope dodged a speeding bullet. Astronomers using the Fermi Gamma-ray Space Telescope have found a surprisingly young, powerful and luminous millisecond pulsar. Over the past three years, Fermi has detected more than 100 gamma-ray pulsars and typically the ages of these objects are at least a billion year old. But this new object is just a youngster, born only about 25 million years ago. In addition to the very young and bright pulsar, researchers announced they have also discovered a set of nine previously unknown gamma-ray pulsars, a new type that have extremely low luminosity. These were uncovered with a new technique to more efficiently sift through Fermi data. The young millisecond pulsar, named PSR J1823?3021A was found within the globular cluster NGC 6624, not far from the center of our galaxy. 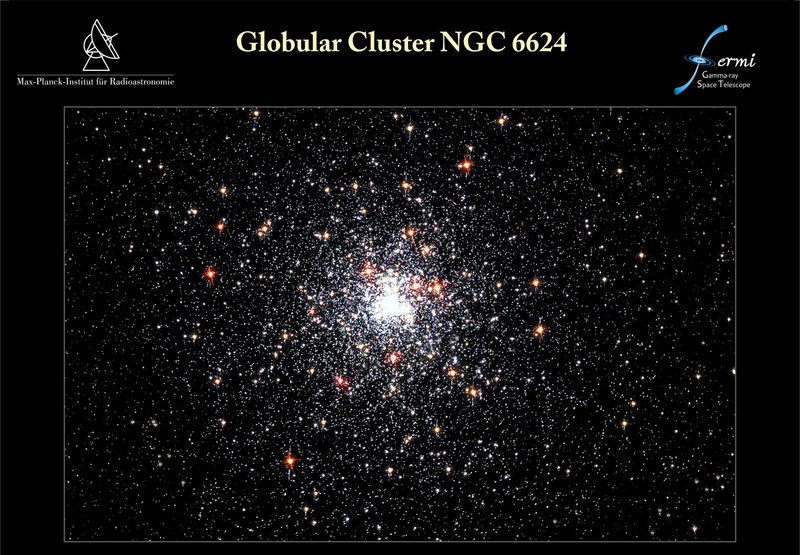 Fermi has detected pulsars in globular clusters before, but usually what it finds are the combined gamma rays from many ancient pulsars within the clusters. But this time, surprisingly, the gamma rays originated from just one very powerful millisecond pulsar. A pulsar is a type of neutron star that emits electromagnetic energy at periodic intervals, sending out signals almost like a lighthouse. Pulsars that combine incredible density with extreme rotation are called millisecond pulsars. These millisecond pulsars are especially fascinating, as they are city-sized spheres about half millions times Earth’s mass, spinning at up to 43,000 revolutions per minute. Millisecond pulsars are thought to achieve such speeds because they are gravitationally bound in binary systems with normal stars. During part of their stellar lives, gas flows from the normal star to the pulsar. Over time, the impact of this falling gas gradually spins up the pulsar’s rotation. The nine new low luminosity pulsars found with Fermi emit less gamma radiation than those previously known and rotate only between three and twelve times per second. Only one of these pulsars was later also found to emit radio waves. Without the new technique, astronomers wouldn’t have found this faint pulsars. ““We used a new kind of hierarchical algorithm which we had originally developed for the search for gravitational waves, and we were quickly rewarded,” said Bruce Allen, director of the Max Planck Institute for Gravitational Physics, a co-author on the recent discoveries. Using what is called a blind search, computers check many different combinations of position and rotational behavior, to see if they match the arrival times of photons hitting the Fermi Large Area Telescope (LAT) coming from the same direction. The search used the 8,000 photons deemed most probable to come from a pulsar at the recognized position, which Fermi’s LAT had collected during its three years in orbit. When the photon arrival times match up with the putative pulsar position and rotation model, a regular pattern of peaks appears in the gamma-ray photon counts, as a function of the rotational position of the pulsar, and a new gamma-ray pulsar has been discovered. “It is a little like sifting through a pile of sand looking for diamonds,” Allen said, adding that the search is ongoing and they hope to find more. Additionally, Allen said, users of the [email protected] project can now be part of this search, to help specifically to search for the first pure gamma-ray millisecond-pulsar. Allen is the director of this project and said this discovery would be a significant contribution to our understanding of pulsars. NASA has a new interactive web feature about Fermi and the 100 pulsars it has now found. The blazar 3C 454.3, a bright source of gamma rays from a galaxy 7 billion light-years away just got a whole lot brighter. Observations from the Fermi gamma-ray telescope confirm that since September 15th the blazar has flared up considerably, increasing in gamma-ray brightness by about ten times in the from earlier this past summer, making it currently the brightest gamma-ray source in the sky. 3C 454.3 is a blazar, a jet of energetic particles that is caused by the supermassive black hole at the center of a galaxy. Most galaxies are thought to house a supermassive black hole at their center, and as it chomps down matter from the accretion disk that surrounds it, the supermassive black hole can form large jets that stream out light and energy in fantastic proportions. In the case of 3C 454.3, one of these jets is aimed at the Earth, which allows for us to see and study it. This blazar has started to outshine the Vela pulsar, which because it is only 1,000 light-years away from the Earth is generally the brightest gamma-ray source in the sky. 3C 454.3 is almost twice as bright as Vela in the gamma-ray part of the spectrum, even though it lies 7 million times further away from the Earth. 3c 454.3 has also brightened significantly in the infrared, X-ray, radio and visible light. This is not the first time the blazar has shown an increase in brightness. Over the course of observations of the blazar, it flared-up in brightness in May 2005, and again in July and August of 2007. The Fermi gamma-ray space telescope (formerly GLAST) keeps tabs on the gamma-ray emissions from many sources in the sky. 3C 454.3 is just one of the top ten brightest sources of gamma-rays visible to the satellite, a list of which can be found in an article Nancy wrote in March, The Top Ten Gamma-Ray Sources from the Fermi Telescope. The cause of the intermittent flare-ups in 3C 454.3 and other blazars is still a mystery, but this current brightening will give astronomers better data as to what the possible cause could be. There seem to be no periodic events associated with the flares in blazars (with the exception of the possible “supermassive black hole binary” OJ 287). Fermi’s Large Area Telescope has detected bursts of gamma-rays in the binary system Cygnus X-3, which astronomers say are coming from a microquasar. While microquasars have strong emissions across is a broad range of wavelengths, this is the first time this type of object has been detected in gamma rays. “Cygnus X-3 is a genuine microquasar and it’s the first for which we can prove high-energy gamma-ray emission,” said Stéphane Corbel at Paris Diderot University in France. Microquasars are stellar mass object that displays in miniature some of the properties of quasars: a normal star begins shedding its matter onto either a neutron star or a black hole. This phenomenon produces large amounts of radiation and “jets” of material moving at relativistic speeds—more than 10% the speed of light—away from the star. These “relativistic jets” are a great mystery that astronomers are still trying to understand, but this new gamma-ray microquasar could provide new ways to study them. At the center of Cygnus X-3 lies a massive Wolf-Rayet star. With a surface temperature of 100,255.372 Kelvin (180,000 degrees F,) or about 17 times hotter than the sun, the star is so hot that its mass bleeds into space in the form of a powerful outflow called a stellar wind. “In just 100,000 years, this fast, dense wind removes as much mass from the Wolf-Rayet star as our sun contains,” said Robin Corbet at the University of Maryland, Baltimore County. The researchers matched the gamma-rays to the known orbital period of the Cygnus X-3 microquasar in order to confirm that the strong pulses of radiation were, in fact, originating from the object. They also matched the gamma-rays with radio emission from the relativistic jets of Cygnus X-3. Every 4.8 hours, a compact companion embedded in a disk of hot gas wheels around the star. “This object is most likely a black hole, but we can’t yet rule out a neutron star,” Corbet said. Between Oct. 11 and Dec. 20, 2008, and again between June 8 and Aug. 2, 2009, Cygnus X-3 was unusually active. The team found that outbursts in the system’s gamma-ray emission preceded flaring in the radio jet by roughly five days, strongly suggesting a relationship between the two. These new findings should provide more information about the formation of such mysterious and fast-moving relativistic jets. This research appears in the 26 November issue of Science Express.